These are some of the interesting saris that I wore in the last few weeks ..
First one is a Pune sari, apparently worn by fisherwomen. Its cotton and has these beautiful checks ! I bought it in July 2015 when we were in Pune. Its from a shop called Poona Saree Centre and the address is 12, Wonderland, 7, M. G Road, Pune – 411001; Ph No. 020-26137560. They have their own loom apparently and are amongst the few that make the genuine Pune Sari. I buy all the Khunn blouse pieces from here too. 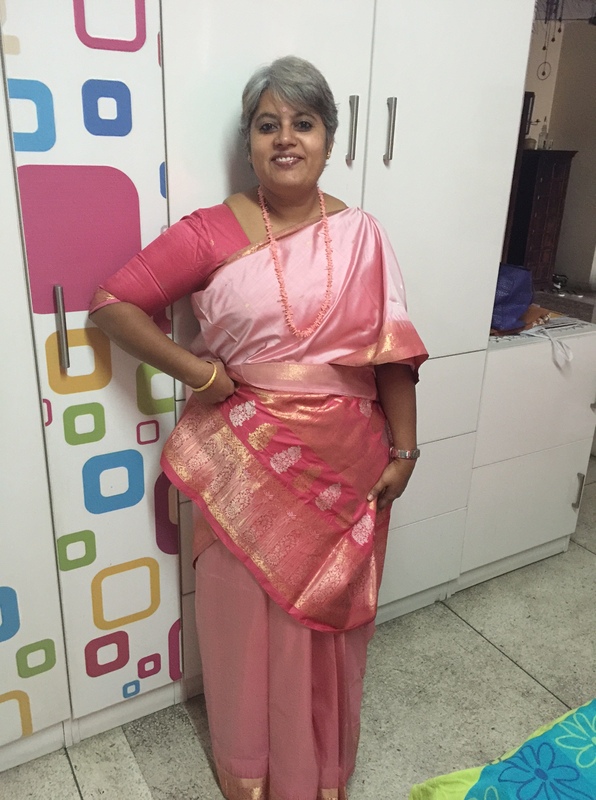 I mixed a plain blouse material and just took a little of the sari to mix and match. The neckpiece is from Desh Maheshwari – flourite stones. 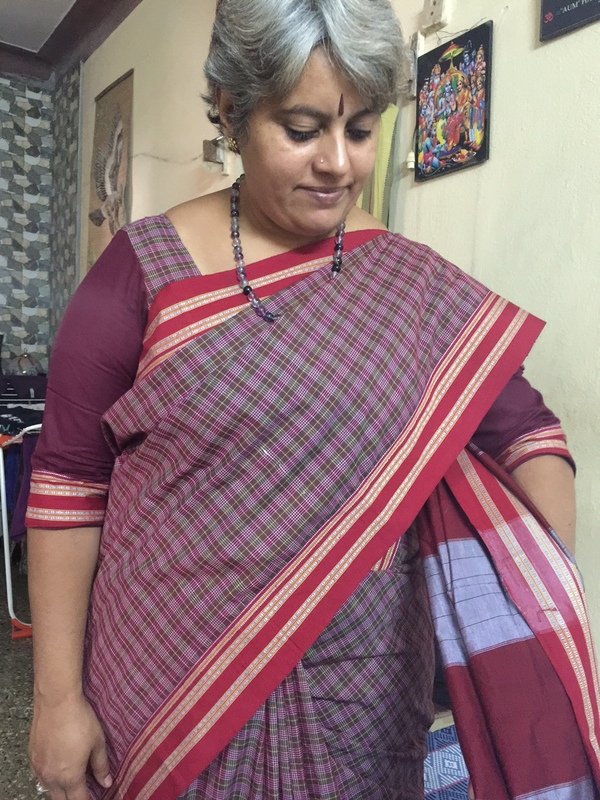 The next sari is from Ahmedabad. We went there in 2011 and I obviously wanted to buy the bandhani. We went to the Gurjari state emporium and their collection of saris was truly sad. Didn’t like any of the pieces and while walking out, Krishnan spotted this sari and another one which is paper silk with geometric design on it. This is a soft tussar with the most beautiful parrot green pallu and the body in standard reddish brown. Wore this to Jayanth and Latha’s house for lunch on Dec 12th. The Khunn blouse is from the Pune store mentioned above. The neckpiece in matching colours is one of my earliest purchases at Desh Maheshwari… I think I bought the neckpiece first and the sari came by later :):):). 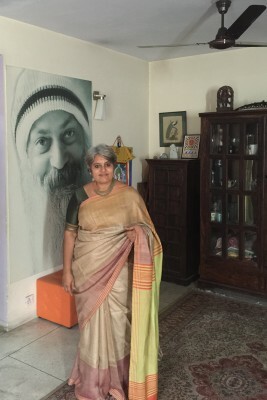 The next sari is a gift from Krishnan for one of my birthday’s. He bought it from Nalli’s in Delhi along with a few others. Just so everyone knows, 99% of all my saris have been bought with Krishnan, and he has great choice. Some of the saris that have got me rave reviews have been bought by him, all by himself, like this one. 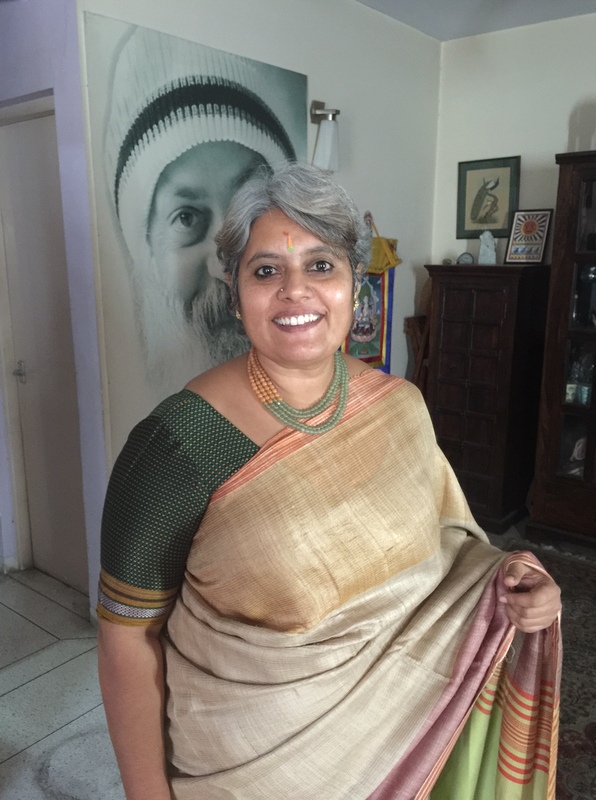 🙂 Its a Kanchi silk sari and I wore it to the Coach certification program a couple of weeks back. The neck piece is again from Desh Maheshwari and its coral slivers. Oh, just love these stones. This sari also happens to be a favourite of my favourite ex-boss, Mohit. Beautiful. I think I like the middle one best. Lovely sarees….. I have a while load of Khunn blouses and plain sarees. Also Khunn incorporated into Kurtas. Aruna, good luck with the sari fast. I did that first for a year and then extended it to two years. Same problem like you, many saris yet to be worn and some to be worn many times over :). Btw, please visit Cooptex now. It’s a different place under Mr. Venkatesh Narasimhan’s leadership. He has simply transformed the organization. Of course Aruna. Ugadi is certainly exempt 👍😂.